Will is co-owned with his breeders, William & Beverly Hill of Santa Rosa Beach, FL. Will was added to my breeding program because Riley's sire is no longer available. The picture above was taken the day he finished his championship. As you can see he was still very immature. Will is still a clear Red Wheaten; he has bone and substance to give. Will is GCL clear, vWD normal, eyes CERFed, and hips and kness x-rayed normal. Will's pedigree can be seen here. Will has been a consistent producer for us and has produced several champions for us including, Ch. Bizzy B's Merry Marksman, Ch. 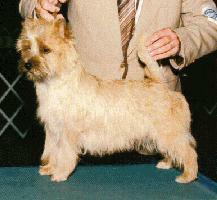 Rose Croft Miss Marksman, Ch. Rose Croft Party Favor, Rose Croft Spiked Punch, Rose Croft Where there is a Will. This page has been visited times since August 7, 1997.